Copita Restaurant takes over from the site that was once Bar Chocolate on D’arblay Street. This is another tapas offering to hit London with a no reservations policy, but luckily we had no problems securing a spot for two on a Friday night. The vibe is chilled, relaxed and very Soho. 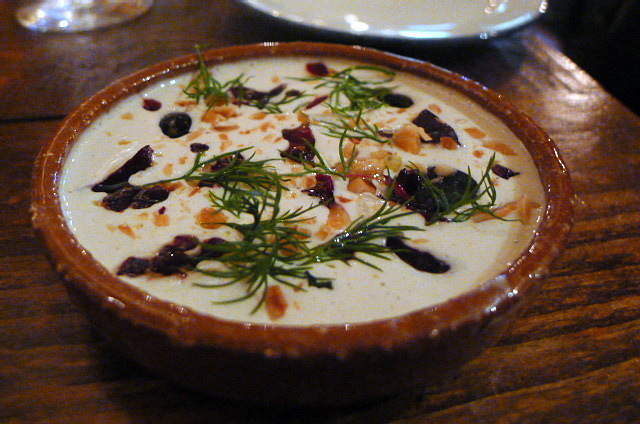 We kicked off with ajo blanco and beetroot (£3.95) which was lovely. A creamy dish, the sweetness of the beetroot pieces provided a lovely contrast to the runny garlic sauce. Duck egg yolk (£4.95) was beautifully cooked with a golden soft core. 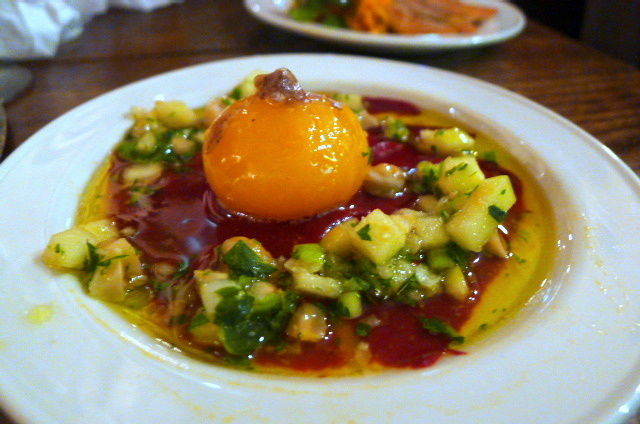 It was accompanied by sweet piquillo peppers which provided an interesting contrast. Crunchy hazelnuts served to complete the dish. Wild sea bass with half a scallop (£6.50) was nicely cooked and moist, but unfortunately very over seasoned and therefore unpleasant to eat. 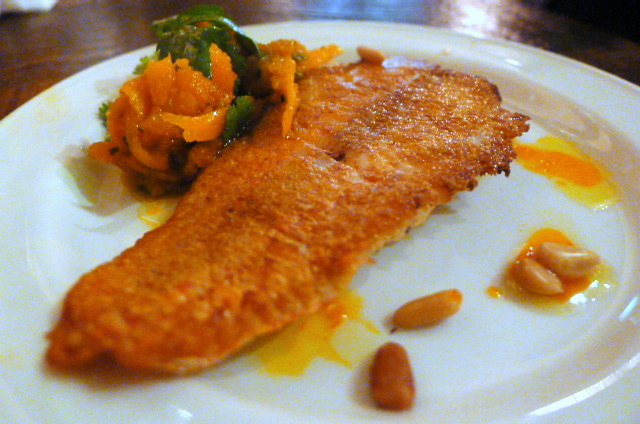 Better was a red mullet a la plancha with saffron (£5.50) which was reasonably tasty. 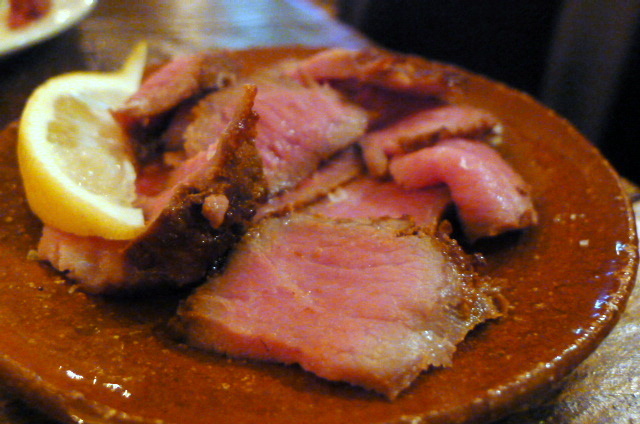 To meat, and a dish of Iberico pork shoulder (£7.95) was extremely yummy, although it bordered on being over seasoned. It boasted lots of flavour and had a nice pink centre. Butifarra, a homemade sausage, with piquillo and chickpeas (£5.95) was meaty and rustic. 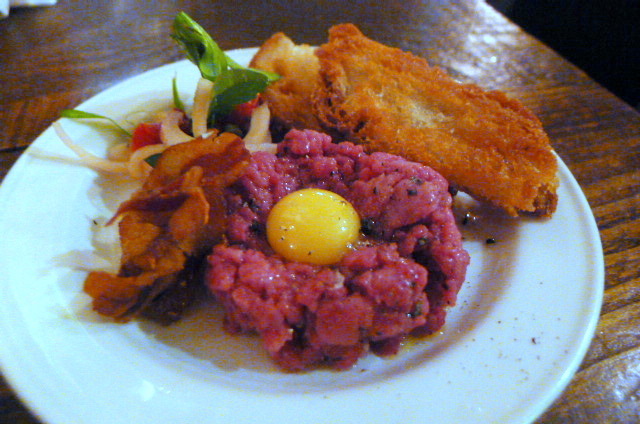 Chopped venison tartare style (£5.50) with quail’s egg was extremely gamey but needed more capers to cut through the richness of the meat. Finer chopping of the venison would have also added more refinement to the dish. 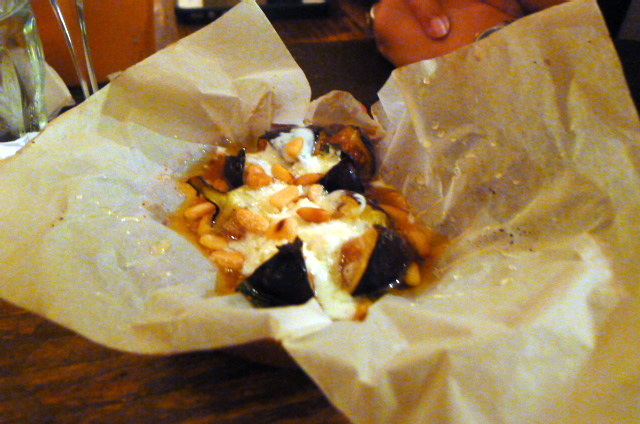 A dessert of baked fig and goat’s curd ice cream (£4.95) looked unappealing and was ill conceived. With the figs being warm, the ice cream had completely melted by the time we started eating it. This was a runny mess with no body to it. 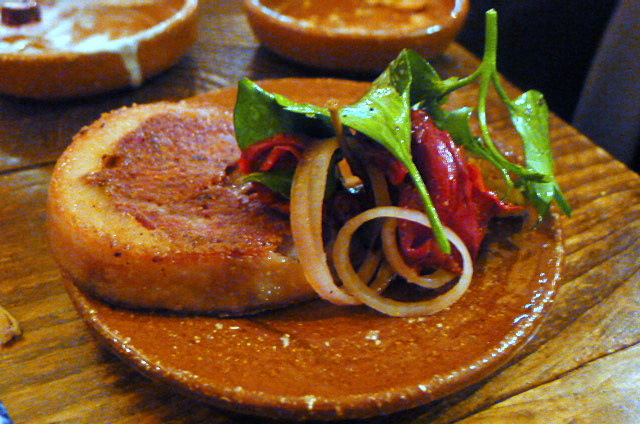 There were some decent dishes such as the ajo blanco and the Iberico pork, but others were less impressive. Melted ice cream does not make for a good dessert. There was an interesting take on some flavour combinations, but a finer culinary hand would have yielded more finesse in the execution. Furthermore, the service could have also been more attentive. On more than one occasion our used plates went uncollected. 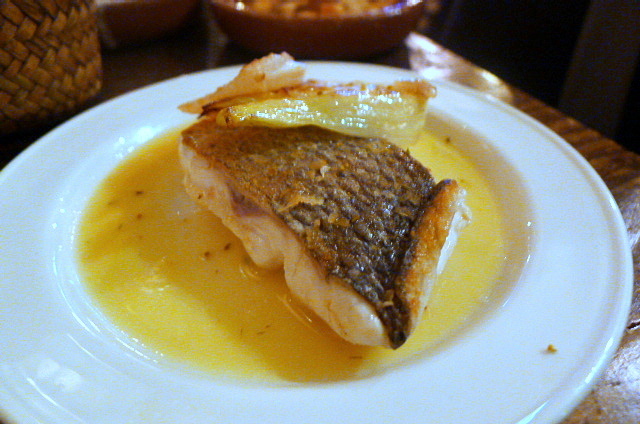 I liked the vibe at Copita – it was fun – but I still prefer the refinement of the tapas at a restaurant such as José. And the portions at Copita were a little small which made it easy to spend a lot. Price range: About £40. Excludes drinks and service. Have visited this restaurant on many occassions as I work close by, and althought the food is great its is very small portions and therefore overpriced. But its the way they run this place which really gets me. They are always adding extra things on to your bill. Its such a shame as the chef is obviously working hard but the management is such that they dont really care about their customers and would rather squeeze them out of an extra couple of quid for things they never ordered. They’ll happily add on extra drinks, and some of the more expensive dishes. Dine here at your own expense!!! sorry to hear you’ve had such a negative experience. Thanks for sharing.